Founded in 1999, Premier Consulting is one of the top independent accounting and advisory firms in Greece. Today, the firm has 20 total employees, 17 of whom are professionals. The firm’s leadership and management have gained international experience by working at some of the largest accounting firms in the world. The firm is trusted by a large clientele from all the sectors of the economy, from Fortune 1000 companies to local SMEs operating in Greece. TAG Alliances' Managing Partner Summit has been featured in a recent CPA Practice Advisor article entitled "Summit Brings Together Firm Leaders to Discuss the Future". TAG Alliances has been named the 10th largest international association in Accountancy's "Top 25 International Networks and Associations 2017". This is TAG Alliances' first year in the Top 10, moving up from it's 11th and 12th rankings in 2016 and 2015, respectively. 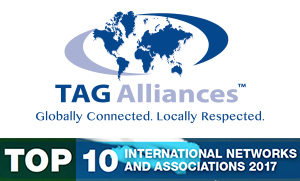 Comprised of the leading professional alliances TIAG®, TAGLaw® and TAG-SP, TAG Alliances has a combined global reach of more than 280 members in over 100 countries with more than 17,000 professionals. RMA Senegal was founded in March 2007 by Papa Alboury Ndao, who continues to successfully lead the firm. Registered under the Senegalese accounting board (ONECCA), the firm's client portfolio comprises some of the largest corporations and NGOs in Senegal, in addition to local and multinational companies from a wide range of sectors, such as telecommunication, banking and production studios.